First strike a chalk line at 6½” away from the centerline of the valley on each side of the roof deck. Drill 1¾” holes at 3” on center along the chalk lines( or 15” wafer cuts at 6” intervals at 6” to 7” from the centerline). Do not drill through any rafters. 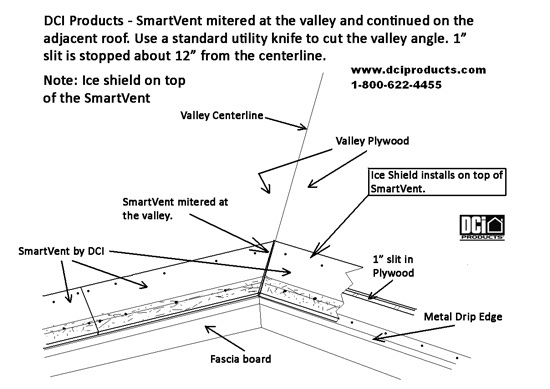 Call DCI Products at 1-800-622-4455 if you have any questions on installation of SmartVent. Install a 12” x 12” square piece of ice and water membrane at the bottom edge of the plywood roof deck where it meets the metal drip edge and fascia board before installing the lower SmartVent piece. This membrane will cover the metal drip edge mitered joint completely. Install one SmartVent with the smooth side up and the thick edge towards the valley. Install a second SmartVent on the opposing side matching the thick edges together at the centerline. Install with eight nails, four along the upper edge and four nails along the lower edge of each SmartVent piece. Angle cut the SmartVent as shown in Figure 2. Please call DCI at 800-622-4455 with any questions. Make sure you install a 12” x 12” square piece of ice and water membrane at the bottom edge of the plywood roof deck where it meets the metal drip edge and fascia board before installing the lower SmartVent piece. This membrane will cover the metal drip edge mitered joint completely. 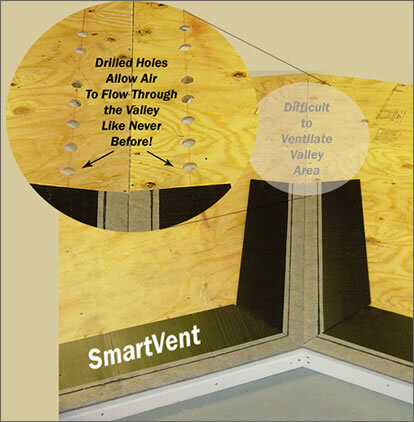 Install your choice of valley protective membrane over the top of the SmartVent after the vent is installed. Continue your roof shingling per manufacturer’s directions. Install your choice valley protective membrane over the top of the SmartVent. (Do Not Wrap the Bottom Exposed Edge Where the Fabric was Wrapped). Continue your roof shingling per manufacturers directions.